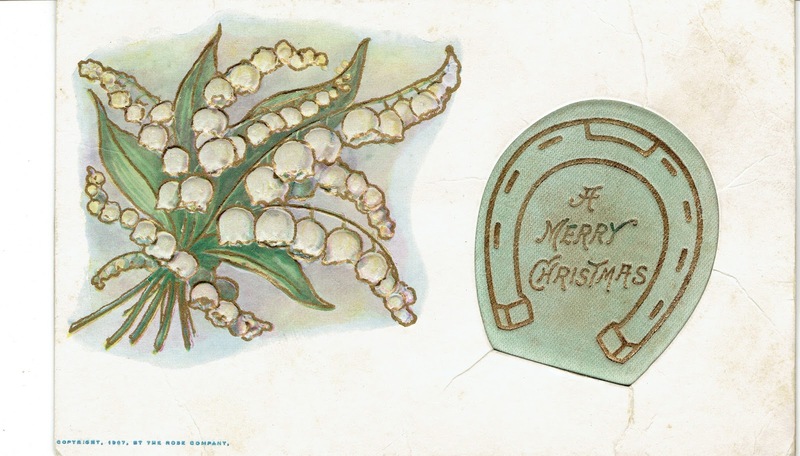 When a gardener collects vintage postcards, especially vintage Christmas postcards, she quickly realizes she needs to narrow down her choices for which postcards to collect, or she will soon be overwhelmed with postcards. 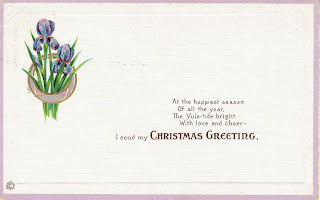 So she decides to look for postcards that feature flowers and plants other than the traditional poinsettias, holly, and ivy. Her eye is drawn to this card which features violets, one of her favorite flowers. Then she finds one with panies on it, also a favorite bloom. 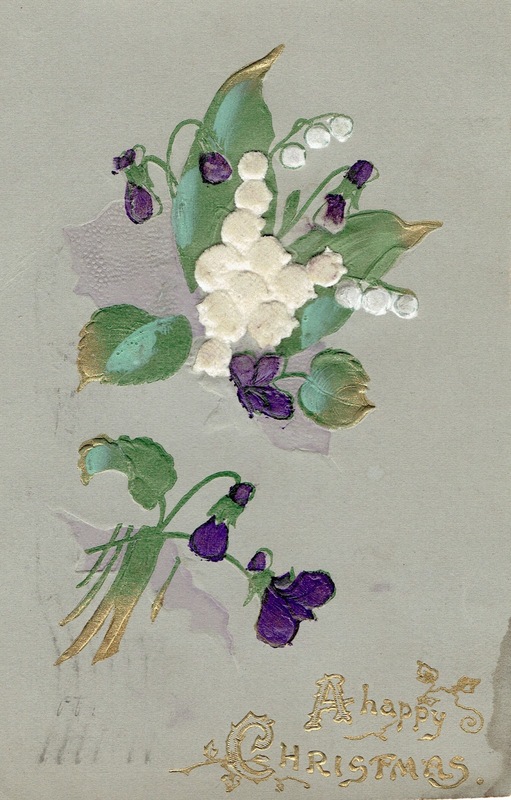 Her horizons are expanded when she finds a card with both violets and lily of the valley on it. She does a little on-line sleuthing and finds out that in days of old, lily of the valley pips were once forced into bloom for the holidays. 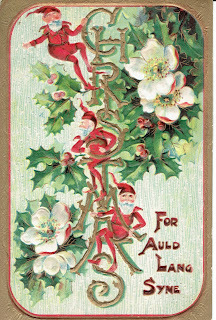 No date on this one, but addressed to Mrs. Ruby Knight, Sheridan, Ind. It was a lucky find for her because now she buys pre-chilled lily of the valley pips and forces them into bloom for herself in the dark days of winter. 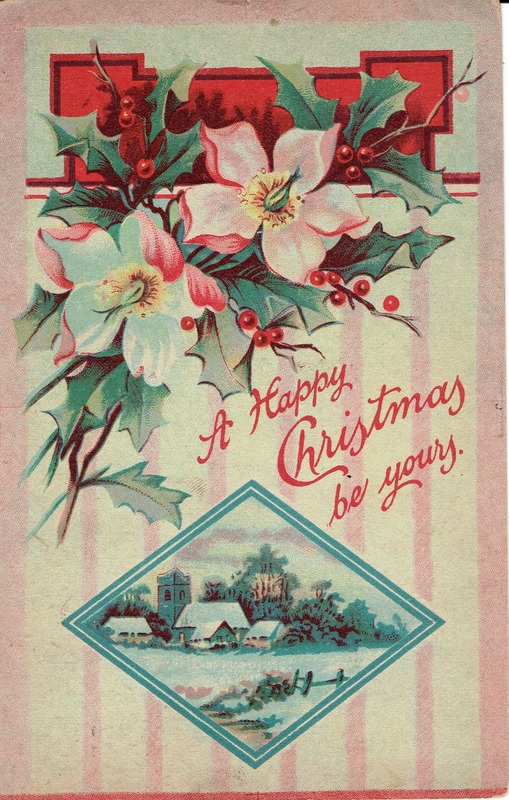 When a gardener collects vintage postcards, she is bound to find some cards with the Christmas Rose, Helleborus niger, on them. They remind her to look for some in bloom at the store. 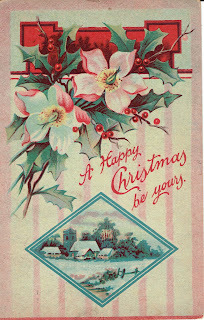 Later she found another card with the Christmas Rose on it. 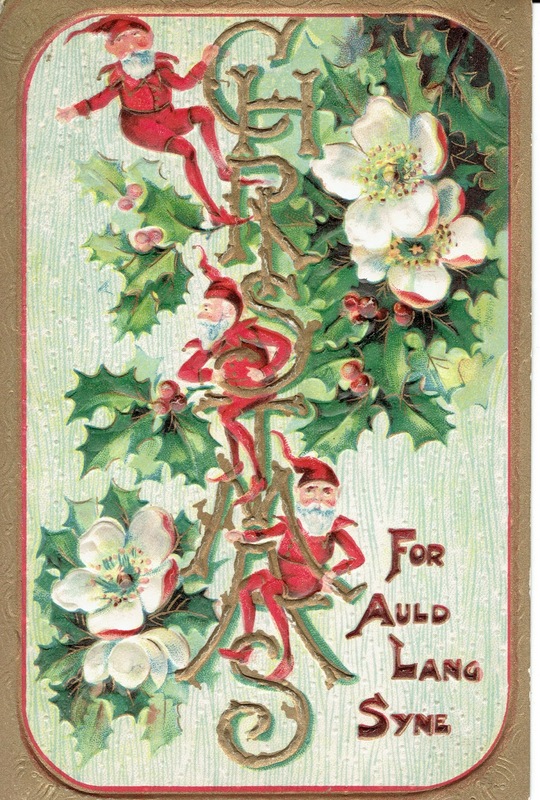 This one also featured little elves, which reminded her of the tree fairies that come inside and mess around in Christmas trees, throwing ornaments to the floor and blowing out some of the lights. 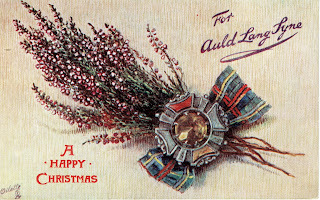 Speaking of Auld Lang Syne, if you are Scottish she supposes heather is a seasonal bloom - at least it is on this card. 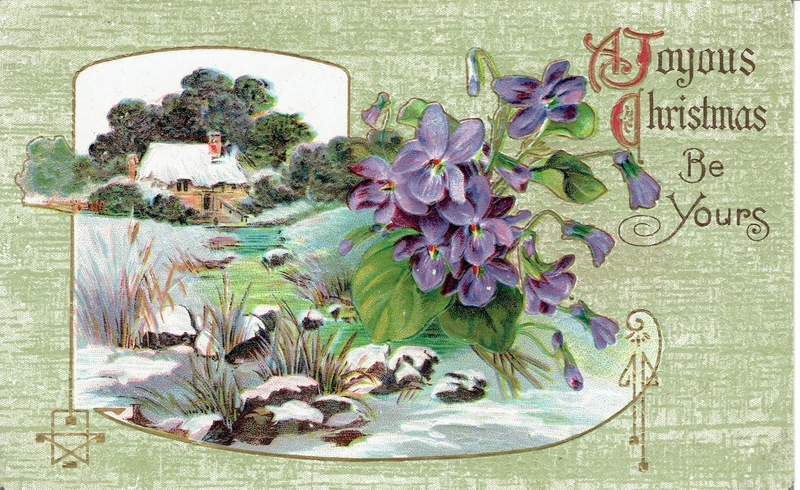 No date, but based on the stamp, it's British. She is not sure who thinks irises are a flower of the season. 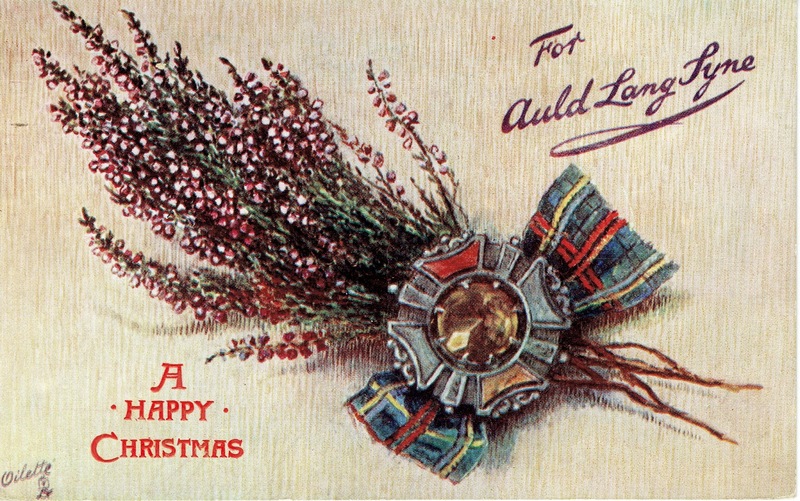 Sent in 1916, 100 years ago! 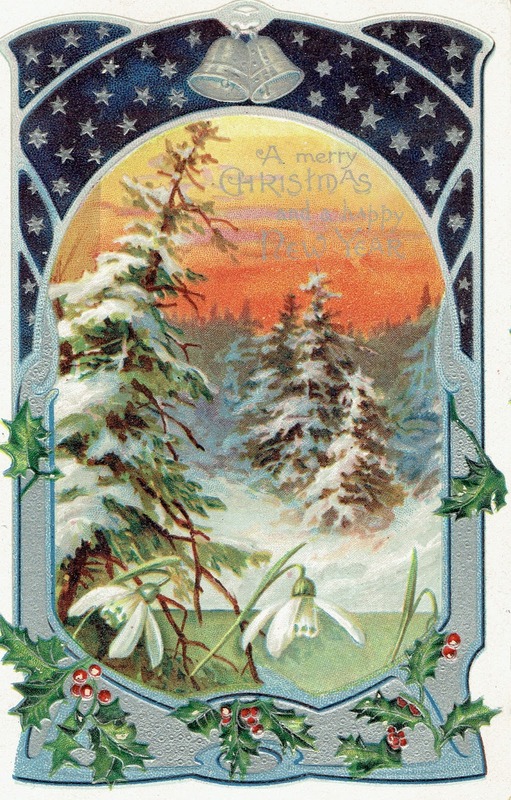 But she definitely agrees that snowdrops can be seasonal. 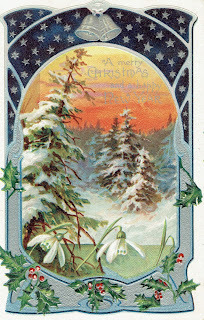 Though her snowdrops usually come up at the end of January or beginning of February, there are some fall blooming snowdrops that might bloom at Christmas time. When a gardener collects vintage postcards, sometimes she buys one with no flowers at all on it. This one reminded her of the story of the Christmas Cottontail, which someday she plans to publish as a book. 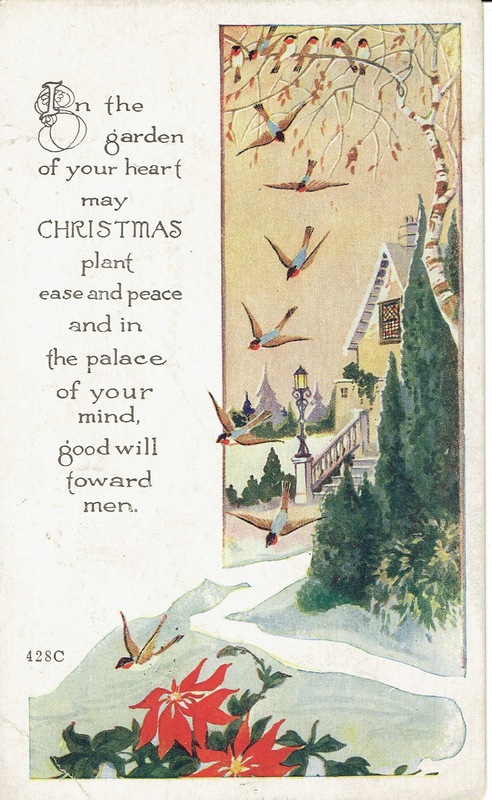 And finally, when a gardener collects vintage postcards, she can't pass on this one. 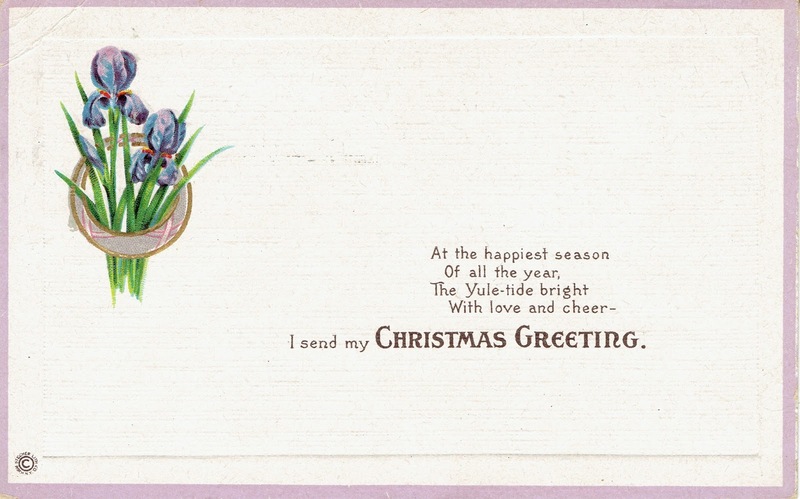 No gardener could pass up a card with a sentiment related to gardening, even if it does feature the most common of Christmas flowers, the poinsettia. 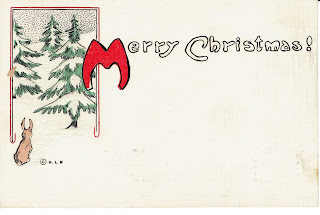 *Most of the postcards in my small collection date from the 1900s through the 1920s. Not all of them relate to gardening and flowers. Check that. All of the ones I really like relate to gardening and flowers. Otherwise, why have them? When I saw the rabbit one, I immediately thought of your rabbit statue on the patio. This is an intriguing array of postcards. Nice collection. I have a few also and display them at Christmas. 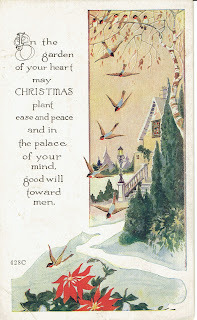 This year I found some thanksgiving cards in an antique store in Christiansburg, VA. He had boxes and boxes of them, all carefully divided into categories. Fun to look at and read the sweet notes. And nice to sit and rest a few minutes while shopping. These are lovely! I've collected postcards in the past too. Love that you have translated what someone thought so long ago, into what you can do now. Even just the concept of an idea...it is amazing how it fades and then grows again. Gardeners really are the best people--even ones who seem like ghosts, our commonalities connect us. They are not gone. and the Snowdrops with the sunset. So beautiful! 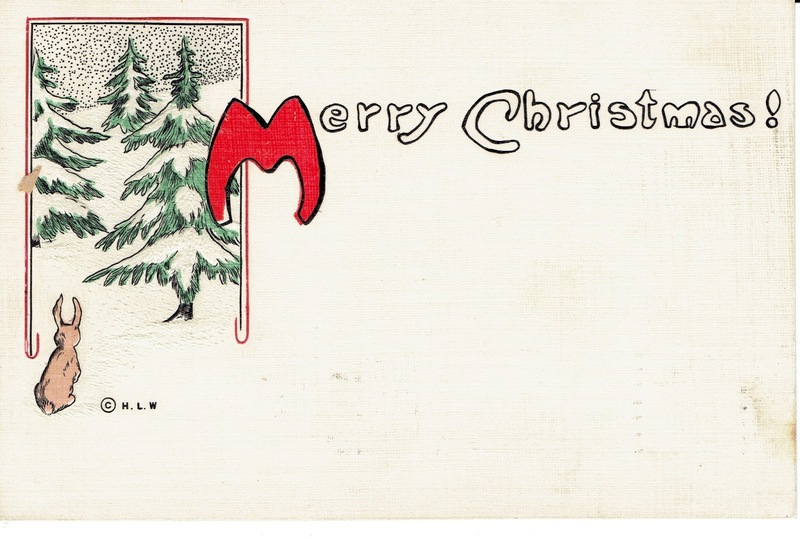 Someone I went to high school and college with collects vintage postcards and sells them on eBay. She will love this post. Those are so lovely. 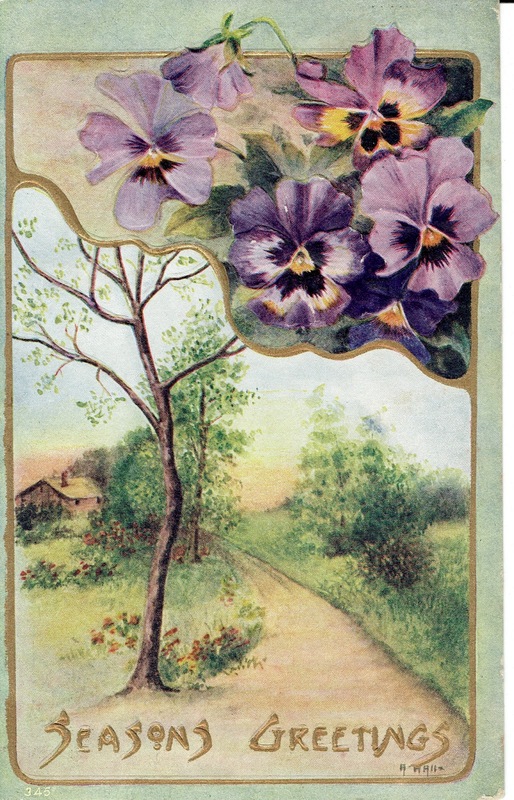 Times and cards have changed so much, but at least the love of flowers continues.